Our Thanksgiving this year was a day of gratitude and thanks. We thanked many people who made our lives what they are this year. And I thank you, all my Artnotes friends, for your support, emotional and financial, throughout 2018. With Mario, the person who thankfully eased our way into the Stimigliano scene, we made a trip to Amelia. Amelia is a typical Italian hill town, in Umbria, less than an hour away. But we went to there not to see the Duomo and luxurious Palazzos, but to see the STONES, which were set around the city in the 4th century BCE. 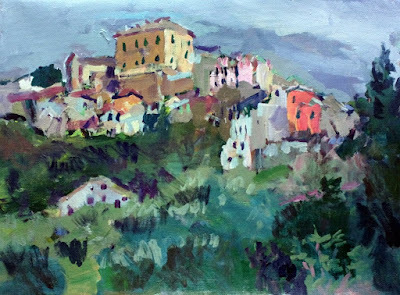 This is the oldest Umbrian city. There is an arch of colossal dimensions made at this time by this civilization (sorry, Romans, an early Etruscan(?) work). 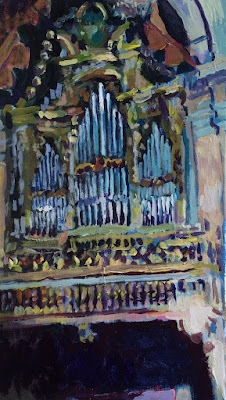 Of course, we did go to assorted and sundry sites, not the least of which where they were tuning the organ! How rare to hear (Avanti…Next, whenever the tuner would get that note just right). This was a week of breakthrough for me. As my arm froze into position while painting in the fog on Monday (think Turner), I realized: I am not going to do this anymore. 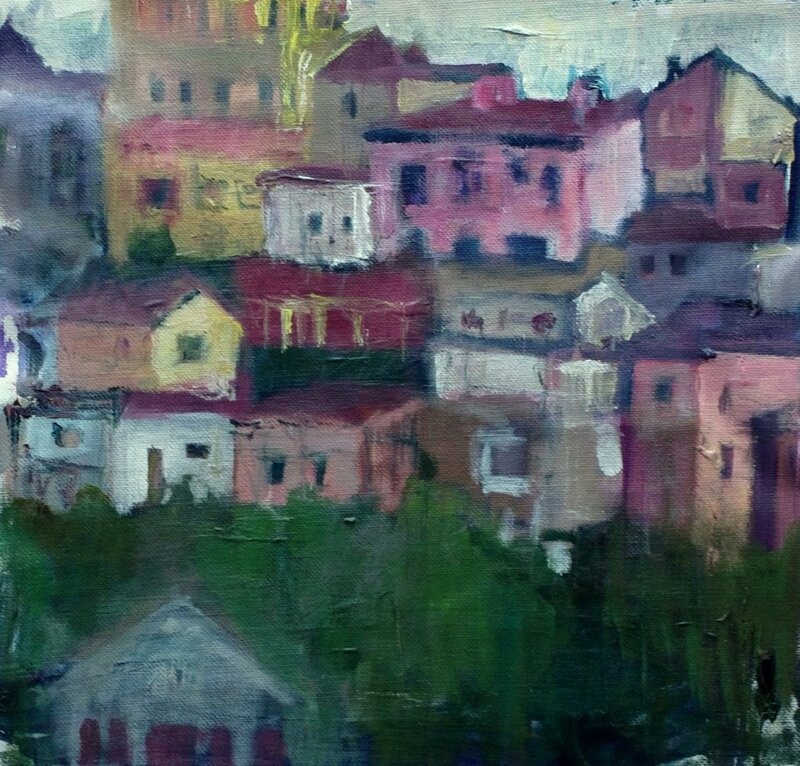 As I paint outside in the wet and cold my fingers stiffen around my brush to the point of not being able to let go. As if by magic, on the way home, I had a vision of painting indoors: Marys. I know, it sounds crazy, but my first undertaking has been a Madonna and Child to sit over our front door. The entry to via Dante, 7, opens to a long barrel vault, dimly lit. Above the door leading to our apartment is an arched wall 4 x 5’, which probably had a Maria in it at one time, likely during the 1600s. Blair’s photograph of a Mary shrine, not far from via Margutta, in Rome, was my inspiration. 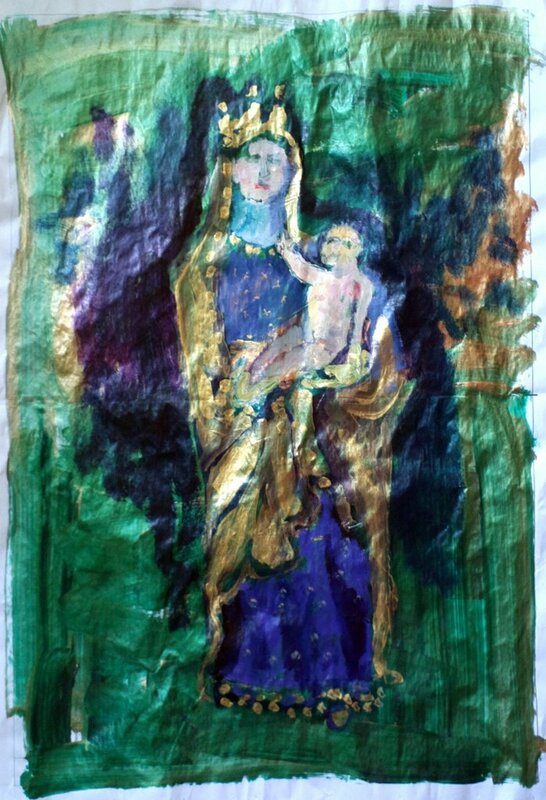 Since then, I have painted another Madonna image from Farfa, on paper. The idea of the Madonna, is not exclusively Christian (and I am certainly not religious). Ancient Egyptian women, adorned in gold, sit in museums; they are shown with their children on the walls of tombs. The Hellenic/Greeks had their own phenomenal goddesses, like Nike; Mary, as Mariam, is the only woman who appears by name in the Koran. Female Buddhas appear in Asian lore. Into the future, Mary Cassatt painted numerous “mother and child” scenes. It is a theme as old as art itself, and as new as now. Likewise Mary Magdalen, reformed prostitute, close friend of Jesus Christ, will be part of the series. I look at her as the alter ego of Mary, the Mother – I picture them leaving after Jesus’ death, with St. Sarah (the patron saint of the gypsies) to arrive at Sts. Maries de la Mer, on the shore of the Camargue, in France. There is enough material for a book. Which brings me to another revelation. After 20 years (yes, 1998, my first letter), I am going to make Artnotes less frequent and focus on bigger projects of the same type. 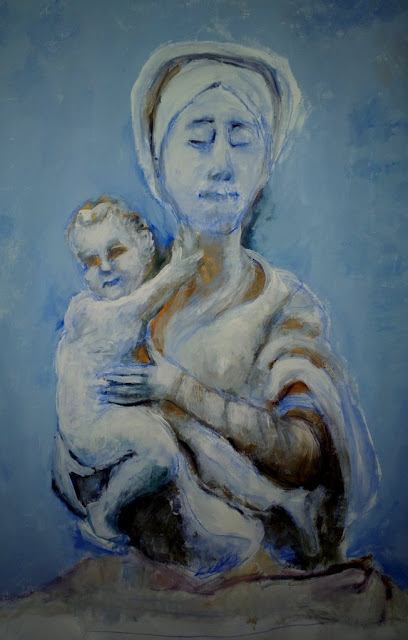 That is, after painting a month of Marys, for example, I will make an e-zine of images, painted and photographed, as well as written information, from a historical and personal point of view. Years ago we did this with a baseball theme, and similarly with places, like Venice https://issuu.com/paintfox/docs/merged. We will continue to paint and post our work and thoughts, just less regularly. I am really looking forward to studying my subjects in greater depth. And certainly, come springtime, we will paint outdoors once again.